Prince of Persia: The Forgotten Sands was released on May 18, 2010. The game was released on the PS3, Wii, and Xbox 360; as well as the Nintendo DS , Sony PSP , and PC . The PS3 and Xbox 360 versions had a MSRP of $59.99, while the Wii had a MSRP of $49.99. 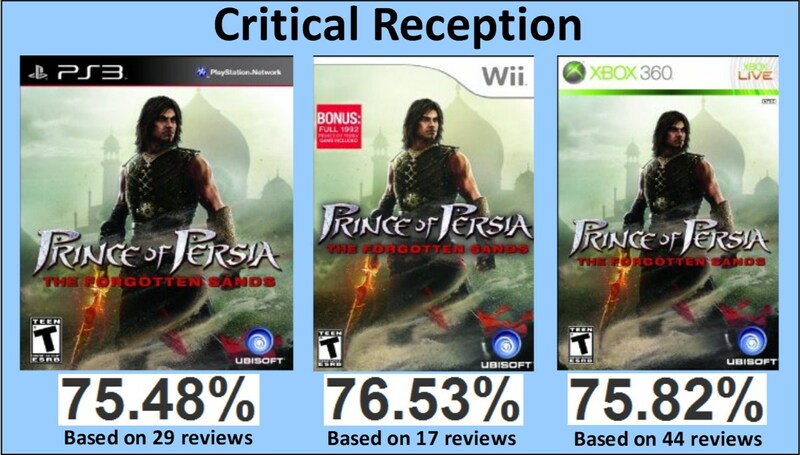 Just today, I noticed several online retailers dropped the price of Prince of Persia: The Forgotten Sands on the PS3, Wii, and Xbox 360 versions. What retailers was it and how much has the price dropped on the game? Well, I saw Amazon.com and GameStop.com, now have the PS3, Wii, and Xbox 360 versions with new "List" prices. The PS3 and Xbox 360 versions of Prince of Persia: The Forgotten Sands are listed at $39.99, while the Wii version is listed at $29.99. I find it surprising the game has only been out for 52 days, and it has already seen a significant price-cut. 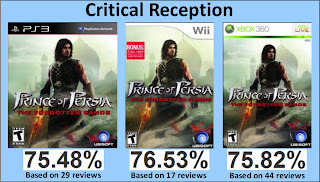 Tony Miller, of Nintendo-Okie.com, reviewed the Wii version of Prince of Persia: The Forgotten Sands and really enjoyed the game. You can read his full review, HERE. If you're a multi-console owner, like myself, one thing to consider if you're interested in the game is that the Wii version contains the original 1992 Prince of Persia game, included as a bonus. If you played any versions of Prince of Persia: The Forgotten Sands, would you recommend it to other console owners? If so, which console version did you play? Also, if you have played the game, do you agree or disagree with the review score average on the game? Do you think it should be higher or lower? I played the Wii version and after about 3 hrs, I had to put it down. It just wasn't doing it for me. It was like eating a meal that was missing the meat portion. It had all the fixin's for a decent game but "Where's the beef!?" It was fine, but not a full return to the SoT series and ultimately too short and lacking story depth. So long as you don't pay full price, you won't be disappointed. It had innovative platforming and a new combat system, but it also wasn't nearly as satisfying as the SoT combat. Good music and a good start to the story hooked me, the combat arenas extended my gameplay a little bit, but I felt that this did not reach the same heights as the previous SoT series. I was wondering how far you made it, I guess the "beef" was found in Monster Hunter? Which version of the game did you play? Did you play the PS3/Xbox 360 version as well as the Wii version? That's crazy how fast it dropped in the UK. It lasted almost two months here in North America. If your comment didn't have that random link in it, as a first comment; I would have left the comment. Since it did, I'm copying/pasting your comment beneath this one without the link. Thanks to everybody for taking the time to leave feedback! "What is the reason of price cut since it received lots of positive reviews? There are negative but only few and one those few is The Butcher. Well I guess the quota of target sales is already reached on their first week and cutting price just a marketing strategy of greater sales. I haven’t bought the copy yet coz I’m still busy with my Assassins Creed 2 and hoarding more of wow gold but on 2nd thought its already great sale to buy."